If there’s any food I could make with my eyes closed, it’s fries – crispy sweet potato fries. Not deep-fried, but air-fried. In case you’re not familiar with an air fryer, it’s a kitchen appliance that cooks by circulating hot air around food at a high speed. The result are extra crispy sweet potato fries with practically no oil. Soaking the sweet potatoes in water (to release some of the excess starch). Drying the sweet potatoes after soaking (to get as much moisture out as possible). Coating the sweet potatoes in a thin layer of corn starch (to provide something for the heat to grab on to and help crisp up the fries). Not salting the sweet potatoes prior to baking (because salt can soften up the fries, yielding limp fries). Baking the sweet potato fries on an oven rack as opposed to a baking sheet (to allow for even air circulation). Spacing the fries out as much as possible (to ensure the fries bake and not steam). Making one batch of fries in the oven at a time (to prevent too much vapor releasing from too many potatoes and again, steaming the sweet potatoes). Turning the fries half-way through baking (to bake both sides of the fries evenly). 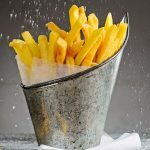 Even after trying all these tips and tricks I read about in cookbooks and on various food blogs, I always ended up with soggy fries. The closest I’ve come to were sweet potato fries that somewhat crisped up in the oven, but lost their crispiness as soon as they started to cool down. The frustrating part was that I knew how sweet potato fries were supposed to taste, but they just didn’t. That being said, I was convinced that it was possible to make crispy sweet potato fries. There are so many brands of bake-able sweet potato fries in the freezer section of any grocery store. So I looked at the backs of all the bags I could find, and made about fifty batches of baked sweet potato fries with various success. (I wasn’t lying when I said I could make them with my eyes closed). And then something happened. My husband (Tanner) bought me an air fryer. I don’t know if it was a result of me constantly complaining about not being able to make crispy sweet potato fries or him being tired of having soggy sweet potato fries as a side for dinner. Regardless, now I can finally make super crispy sweet potato fries every single time and use no more than a drop of oil. I like the white sweet potatoes because they look just like regular potatoes. Yes, I like to trick people into thinking that they’re eating real fries, ha! However, the orange sweet potatoes are a bit healthier, containing more antioxidants and less starch. As far as flavor goes, white sweet potatoes are less sweet than their orange counterparts. Although you don’t technically need any oil, I still recommend adding just a tiny bit to coat the sweet potatoes. The oil helps create an extra crunchy layer and prevent the sweet potatoes from drying out while being air-fried. One of the most challenging things about making homemade French fries is cutting the potatoes. To cut the sweet potato into even sticks, start by slicing the potato lengthwise into even slabs. How thick you make these slabs will determine the thickness of your fries; a 1/4″ (0.6 cm) is one of the most popular sizes. However, you can go thicker or thinner depending on your preference. Next, stack those slabs, making sure their flat edges are aligned. Cross-cut them lengthwise into sticks, making sure to maintain the same thickness as before. If you cut each slab a quarter inch thick, this cut should also be a quarter inch thick. The most important thing is that the dimensions are even. Use an air fryer. The reason air fryer is superior to any type of oven is that it uses what Philips has patented as “Rapid-Air Technology”. This means that hot air is circulating very, very quickly around whatever food you are cooking, and in doing so, it evenly cooks food. 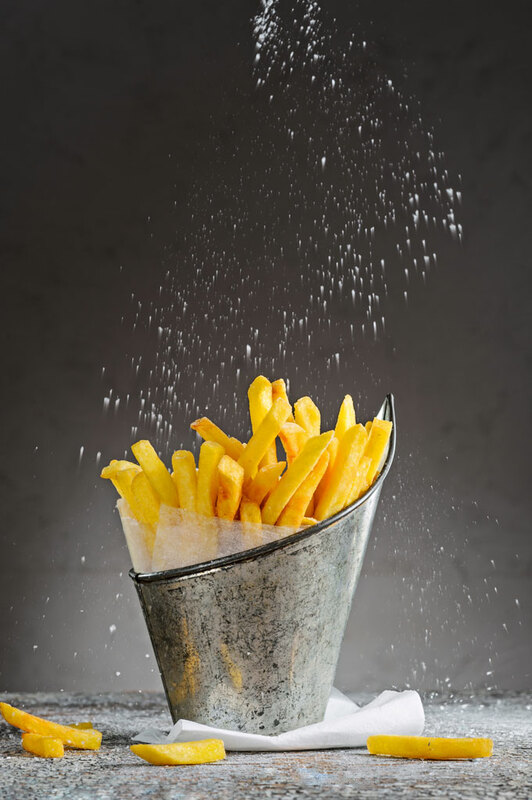 Moreover, the quickly moving hot air gives your food a fried feel and taste without you having to actually fry anything. If you don’t own an air fryer, but still want to make sweet potato fries, try the oven. As I said, I haven’t had success with it, but perhaps you will. Also, if you have any tips for making oven-baked sweet potato fries, please, share them below. I would also love to know if any of you have had success with baking sweet potatoes fries. Crispy sweet potato fries made in an air fryer. Simple, healthy, fast, and packed with flavor. With a sharp knife, cut the sweet potato into 1/4" x 1/4" (0.6 cm x 0.6 cm) sticks (see the tip for cutting potatoes into fries in the "technique" section). Place the sweet potatoes in a dry bowl and add the olive oil, salt, and pepper. Mix thoroughly. Preheat the air fryer to 380°F (193°C). Every air fryer is different so you might not need to preheat the appliance. Take half of the sweet potato sticks and place them in the airfryer basket. "Fry" for about 12 minutes, checking on the sweet potato fries towards the end of "frying". 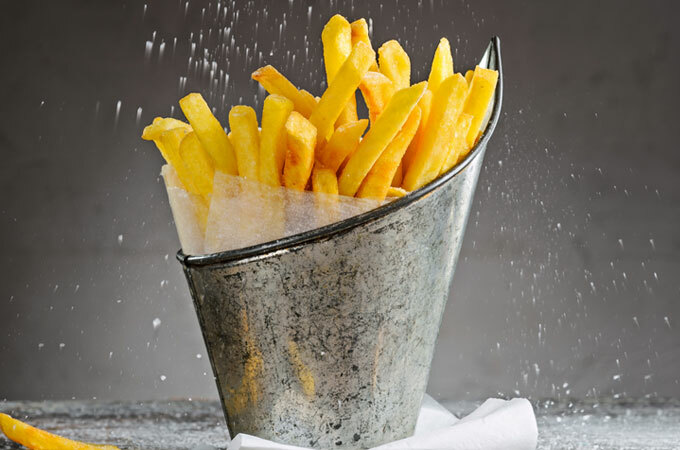 (Depending on your model, you might need to take the fries out of the airfryer sooner or keep them in the air fryer longer). 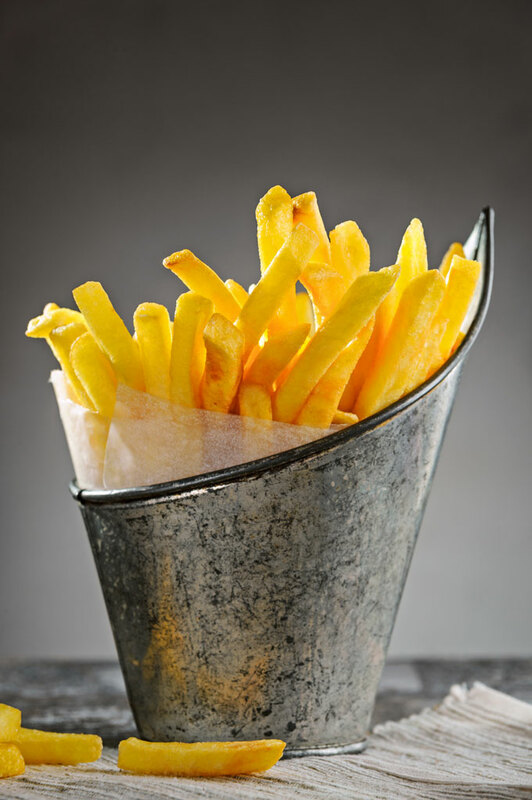 The fries should be crispy with a little bit of browning on the edges. Store leftover fries covered in the refrigerator up to 4 days. Reheat in a 375°F (190°C) oven/air fryer until hot.